Each player is dealt four cards that are placed, face down, in a row in front of him/her. Everyone is allowed to look at their two outermost cards. Players do not look at the middle two cards, and they do not look at their opponents' cards. The remaining cards form a draw pile, and the top one is turned over to form a discard pile (if this card is a power card, it is placed in the middle of the draw pile and a new one is drawn). The objective is to have the fewest points at the end of the game. The points are the total of all cards that the person has at the end of the round. Therefore, players try to get rid of high cards like 9's and gain low cards like 0's. Since cards are left face down, memory is a very important part of this game. On a player's turn, he/she takes a card. This can either be the top card of the discard pile (but not if it is a "power card"), or the top card of the draw pile. Anyone who takes a card from the discard pile uses it to replace one of his/her face down cards, and puts that card on the discard pile. The other choice is to take a card from the draw pile. If this is a number card, the person may either use it to replace one of the face down cards, or place the drawn card directly in the discard pile. If the draw pile is exhausted, the discard pile is reshuffled and placed face down. If a "Peek" card is drawn, the player may immediately look at ONE of his/her face down cards. If a "Swap" is drawn, the player may switch one of his cards with one of another players' cards. However, the player may not look at either card until receiving a peek card. If the player does not want to swap, he/she does not have to. A player drawing a "Draw 2" card then draws another card from the pile, and may use this card as if it were a normal turn. 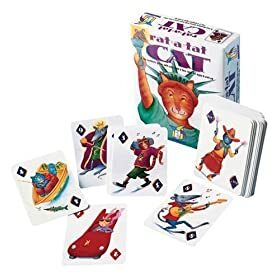 However, if it is a number card and is discarded, or if it is a power card and the player decides not to use it, the player then picks another card from the pile, and plays that as if it were a normal turn. At the end of a player's turn, he may choose to end the round. All other players get one more turn. After that, everyone counts up his/her points. Any power cards are placed at the bottom of the deck and replaced with the top card. 1. Play for a specific length of time, and the person with the fewest points at the end is the winner. 2. Play a specific number of rounds, and the person with the fewest points at the end is the winner. 3. A player with a certain number of points is kicked out of the game, and the last one still in is the winner. Authored by games.editor on Aug 08, 2008. Authored by kidslikeinfo on Aug 08, 2008.